The St George’s Chapel Archives holds a collection of Chapter bills from the eighteenth and nineteenth century. These record sums of money paid for works done in the College, such as bricklaying and carpentry, and for the provision of services, such as teaching and organ tuning, and of materials, from coal, to wax candles, to bread and beer. Each of these bills contains only a small amount of information: a date, an item to be paid for, a sum of money. Occasionally they will include extra information, such as the name of the payer or payee, or an explanation for why an unusual thing was being paid for. Looked at as a series, these bills provide an insight into day to day life in the College at the time and they ways in which it differed from life as we know it today – as well as the ways in which it was the same. 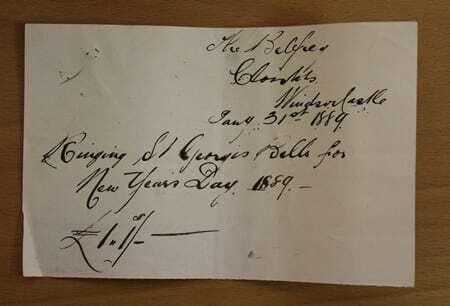 On 31st January 1889 the bill pictured above was written for £1 1s to pay for the bell ringing that took place on New Year’s Day that year [XIV/1889M/4m]. This is the equivalent of just under £70 in today’s money and would have been split between the eight bell ringers. There are bills for New Year’s Day ringing from other years too, though not every year, suggesting that it was not then an annual practice or that bell ringing bills from other years have not survived. Welcoming in the New Year with bell ringing is a tradition that continues in many churches today, including in the Curfew Tower here at St George’s. There are a number of other bills dating from the 1880s for items relating to New Year customs, including printing of stamps, anthems and orders of service for New Year services. One New Year expense that occurs repeatedly is for policing at the extra services that took place at that time of year. 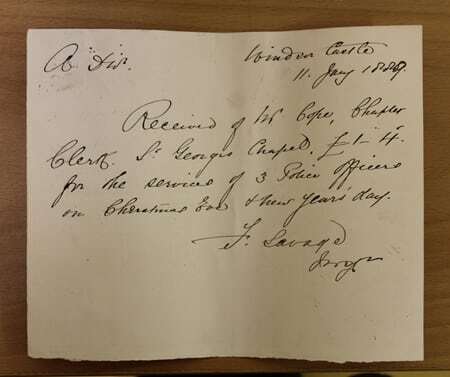 This receipt [XIV/1889M/4d], also from 1889, shows a payment of £1 4s (now between £70 and £80) for three police officers who were on duty on the Christmas Eve and New Year’s Day just past. By the 1880s there were police officers regularly on duty at Windsor Castle, just as there are today. Of the six payments made by the Dean and Canons for additional police attendance at services during that decade, four are specifically for officers to attend the Christmas and New Year services. It seems that the Dean and Canons may have been concerned that an over-flowing of festive cheer would disrupt the otherwise peaceful nature of their services.